18ct White Gold Diamond Fitted Wedding Ring for Trilogy Halo Engagement Ring — Form Bespoke Jewellers Ltd.
A bespoke, diamond set, fitted wedding ring to fit alongside a trilogy halo engagement ring. Sometimes it can be difficult to find a wedding ring that will sit neatly alongside your engagement ring, particularly if it has an unusual profile. 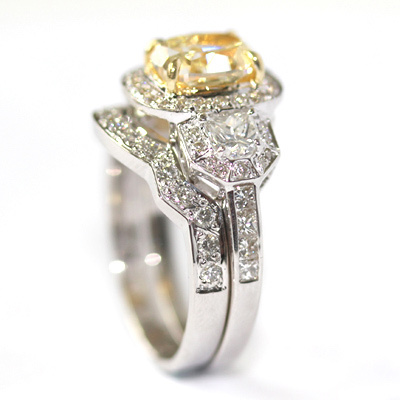 Here, the customer had a bold, trilogy halo engagement ring, so a bespoke fitted wedding ring was the perfect solution. Following the shape of the engagement ring for guidance, our expert Yorkshire jewellers created an 18ct white gold band that would sit like a jigsaw piece next to the existing ring. Along the top of the band, round brilliant cut diamonds were grain set by hand to match the engagement ring design too. 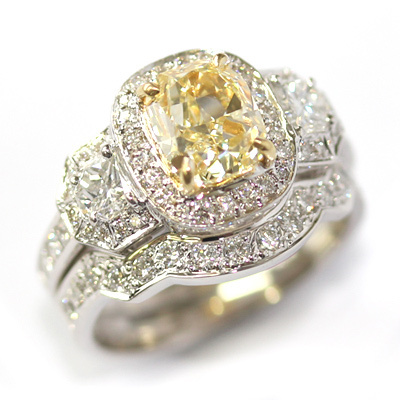 A beautiful, sparkling fitted wedding ring; the perfect accompaniment to the customer’s engagement ring.